brookser	Fall Banding	Comments Off on Nice Carolina Wren recapture! Monday September 30, 2013. 67 new of 16 species; 48 recaps. Bird of the day was White-throated Sparrow with 23 banded. We had expected showers but the 6-hour session was completely rain-free. We’ve been hearing Carolina Wrens singing around the station most of the fall. Ryan had banded an adult and a young one this past weekend at his backyard banding station in Vermont. Today we recaptured a first-year Carolina Wren that had been banded in July this summer. 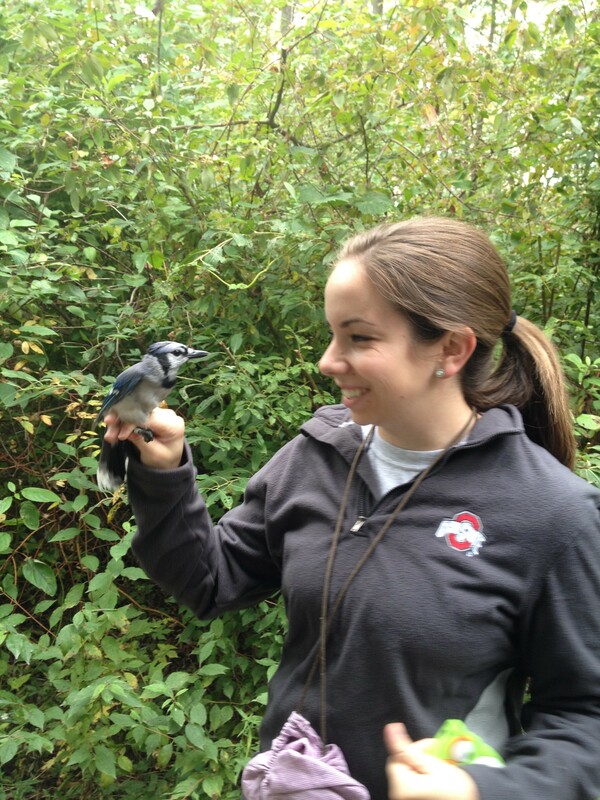 We took time to admire a Blue Jay banded today. Andrea and Betsy began getting the station ready for the upcoming North American Banding Council Certification session this coming weekend. Peggy got ready for a banding demonstration she’ll be giving at Cummings Nature Center on the weekend. Saturday September 28, 2013: 86 new birds of 17 species, 17 recaps. Birds of the day were White-throated Sparrow with 45 banded, and Gray-cheeked Thrush with 7 banded. The bander training class ran the station today, and they did a fabulous job! Since there were six students, they each took a turn being the Bander-in-Charge for an hour. In addition to the regular duties of net-picking and banding, they were also responsible for taking the weather, calculating the net-hours, and compiling the tally. They were further challenged by a fantastic group of students from Hobart and William Smith, who were visiting for the morning. The day went off without a hitch, so kudos to the class! Since this was their last day, they took their final exam in the afternoon before we all said our goodbyes. Golden-crowned Kinglets the majority yesterday … Ruby-crowned today. Andrea Patterson	Fall Banding	Comments Off on Golden-crowned Kinglets the majority yesterday … Ruby-crowned today. We banded seven warbler species including a Northern Parula. The Bander Training Class continued to work at the banding table. They also learned how to remove bands safely and Sue Smith Pagano gave a workshop on how to bleed birds for research projects. Thursday September 26, 2013: 204 birds of 27 species, 17 recaps. Bird of the day was White-throated Sparrow with 77 banded. Golden-crowned Kinglet was a distant second, with 25 new bands. Thrushes and sparrows are starting to replace warblers as the most common birds, and kinglet numbers are starting to build as well. Fall is upon us! The class continued net-picking and processing birds. They are holding up pretty well under the early mornings and long days, and are doing quite well with the material. They took their mid-term exam today, and then we all gathered for lasagna at the BBBO house. brookser	Fall Banding	Comments Off on FINALLY! A Migration! Wednesday September 25 2013. 242 new of 27 species; 4 retraps. New species Yellow-shafted Flicker. Bird of the day was White-throated Sparrow with 78 banded. Runner-up was Golden-crowned Kinglet with 46 banded. This was Ryan’s last day of his five-weeks at BBBO so he was rewarded with the best day of the fall (so far). We had a great group of students visiting from Dr. Kristi Hannam’s Animal Behavior class at SUNY Geneseo. They saw lots of birds banded and also heard short presentations on the orientation research being done by Mark Deutschlander and Jenna Holschuh and the research being done in the MARS trailer by Katie Little for Sara Morris. Finally, plenty of birds in the nets. brookser	Fall Banding	Comments Off on Finally, plenty of birds in the nets. Tuesday September 24, 2013. 100 new birds of 22 species; 19 recaps. Finally, our first 100 bird day of the season. Birds of the day were Golden-crowned Kinglet (19) and White-throated Sparrow (18). Gray Cheeked Thrushes were numerous as well, with 12 banded. Also banded were 8 species of warblers. We did not add any new species to the season total. It definitely felt like Fall, with the cool temperatures, brilliant sunshine and colorful foliage!